The Journey of Water is a project dedicated to understand the drought situation in California. By examining impactful environmental factors in the ecosystem, we were able to identify leverage points in the system and propose meaningful, long-lasting impact for a more sustainable water usage. Are people aware of the drought in California? We conducted intercept interviews in Westfield shopping mall at SF and asked this question to 10 individuals to understand how aware people are of the situation. Only two individuals think that California is still in a drought. The truth? Drought seasons are stretching longer periods of time, and getting more extreme. We created a concept map to visualize the multiple sources and agents involved in the water use in California. During our intercept interviews, 9/10 people believe that they use water the most in their showers (classified under Domestic use). Through research, we found out that even the products that we use everyday has hidden water footprint* involved with virtual water trades*. We created an ecosystem map to better understand how almost every part of our life includes water usage. The water footprint measures the amount of water used to produce each of the goods and services we use. It can be measured for a single process, such as growing rice, for a product, such as a pair of jeans, for the fuel we put in our car, or for an entire multi-national company. As food and other products are traded (especially internationally), their water footprint follows them in the form of virtual water. This allows us to link the water footprint of production to the water footprint of consumption, wherever they occur. To our surprise, we found out that the real culprit contributing to massive water usage is Agriculture. An astonishing portion of water use goes to animal agriculture. Most people we interviewed were unaware that a lot of water is needed for the meat they eat. The reason for the massive water usage is the food that the animals consume. Grass, corn and soybeans are typically used to feed them and these are extremely water-intensive. People are not aware of the drought situation and thus don't conserve water. Encourage people to conserve water through reducing meat consumption and letting them seeing their impact. How can we maximize our impact? We think Whole Foods would be a great partner to collaborate with. Our visions align and it has a close relationship with its food sources such as factories and farms, which allows us to make significant design impact. We examined how the flow of water, products and information and how it gets to the customer. We realized that if we can make this water usage information more transparent to the customers, then they would be more informed and empowered to make an impact and influence the industrial chain backwards. 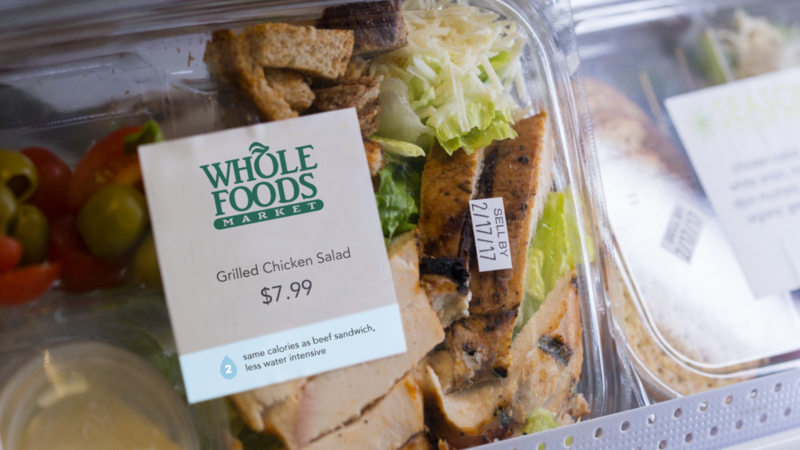 We observed and learned that there are two types of meat purchase goals for the customers at Whole Foods. People's different levels of mindfulness informed us to create solutions around different mental states for greater influence. We mapped out their journey and looked for opportunities in different touchpoints. Based on the journey map, we brainstormed and created several design provocations that reflect the different touchpoints and aligned with the Awareness-Acceptance-Action framework. Customers would be able to see posters all around the store that explains water usage in meat production, raising the awareness of the issue effectively. As customers approach the meat stock, they would see the water intensity signages on the floor. 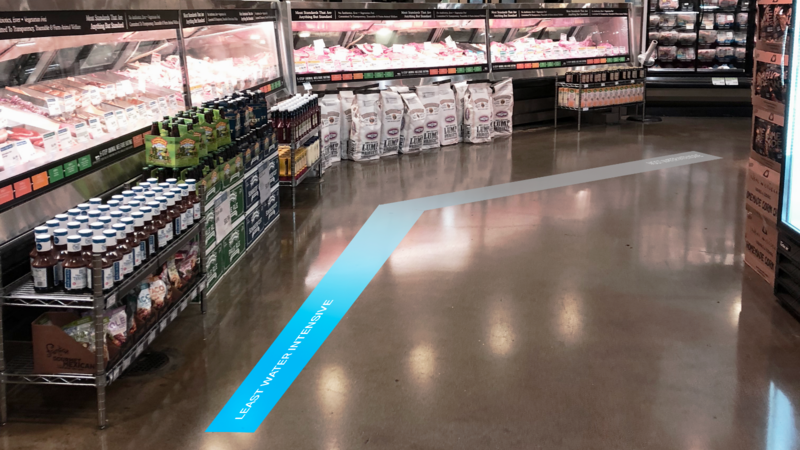 Since the meat section is typically organized by animal sources, we mapped the intensity of water usage on the floor—from least to most water intensive. We believe that by putting water usage information on the labels, customers will be able to make more informed decisions. By using 1000 calories as a basis for comparison, we were able to compare the efficiency of water usage between different types of foods. With this, we developed a water efficiency rating system which will then be reflected on the labels as well. We think that these labels are the most crucial touchpoint for this project. By making information more accessible, we would be able to educate and empower customers; they can compare water-efficiency of different products, make wiser purchase decisions and realize that the potential for impact and change is in themselves. When customers check out, they would also be able to see how much water they saved based on their purchases. Customers will have an option to create an account to Water Adventure—a place where they can visualize the accumulation of water they saved. We visualized it in the form of a journey, starting from where the customer is to a national forest which has been suffering severely from drought. When they have successfully accumulated enough water to complete the journey, they would be able to claim their trip to the national forest, and witness their impact for themselves. With the design solutions from awareness to action, we hope that we can encourage each individuals to rethink about their purchase and realize the ability in themselves to change the environment. Through investigating the water flow in California with system thinking, we learned how to locate the inefficiency in the systems to maximize the impact and encourage behavior change through data visualization. If we had more time, we would like to have more conversation with potential customers and reach out to stakeholders to validate the feasibility of the solutions. Designing a more intimate and emotional letter-sending experience.